TurnOut Mag & SchemerMag Templates updated! I added to more functionalities to the two Free Premium blogger templates TurnOut Mag and SchemerMag that I released a couple of days ago. Previously, we have to add small images to the top of the post to display thumbnails on the homepage. Even, if go to post pages, the thumbnails stay as thumbnails. But, now, I added the AutoThumbnails feature to the template. You can add big images to your posts, doesn't matter you add them at the top of the post or at the bottom of the post. This trick automatically grabs the picture from the post and resizes it on the homepage.. and the same pic appear in full size in the post pages. Previously, we have to edit each and every post to display the summary on the homepage.. If we don't edit them.. the homepage looks crappy. But, with the additional feature I added, doesn't matter if you have 1 post or 1,000000 posts, the trick will automatically summarize the text for you on the homepage..
With these two additional features, Personally I feel, these are the top 2 Blogger templates of all time with so many features included...what do you say..? So, why not test the layout on your blog..? Download the Turnout Mag here and SchemerMag here. NOTE : You DON'T need to change these if you are downloading a FRESH COPY now! Downloaded the previous version (2 days ago) and want to change to this one? Simply make these couple of changes..
and REPLACE it with this.. Okay seriously, I totally just finished tweaking the turn out mag for one of my blog (which I'm in heavenly love with by the way) and now I see this and I'm crying big crocodile tears. Is there a way to add in these new features manually? Post updated.. read it again! I will try it soon. Thanks, kranthi. Hi, its me again. I've updated the new features, really nice. Still got the problem though, about labeling. My question is as before, is it possible to edit the date and label become two lines instead of one so that it fit the same column size and I dont have to re-labeling my post? I've tried to post another but looks awkward and the post getting un-arranged, Unless I post 2 at once with the same label length. I hope I'm not confusing you. Thanks!! If you want to change the labels line to 2 lines by default.. Done thx! I made it 18 px. Btw is it possible to have the previous post as beautiful as the font view? 1) In SchemerMag template... there are no post details like the date, author, labels etc, neither in the summary nor in the full post... I guess you should add those details in the full post... what say??? PS: I know its off topic... but I don't know where to ask this... I've googled about this but came out with nothing, I tried creating nest of lists (list under list) in sidebar but blogger doesn't allow that for some reason... is there any way out? I can't solve the fix error problem. I'm online now on Yahoo..
Come to chat using the Online support widget here in this blog in the sidebar. Brilliant Kranthi, trying to keep up with the html (it's a bit alien to me! )But this is a great template. "Loazzolo Wines" as the headline instead of "Turn OutMag" and below it the following quote: "The vineyards of Loazzolo are so difficult and steep that here I heard the earth talking, through the vineyards, to the sky: by drinking the wine of these vineyards we can get closer to the Gods." The description is a bit too long.. can you short it a bit..may be less than 100 chars.. Thanks for all the tips! I'm a newbie and I can barely understand computer-speak, but you're helping me along here. Thank you! description: "...by drinking the wine of these vineyards we can get closer to the Gods." P.S. Can't seem to get the 'blog tips' link back to you right, could you take a look in the right hand column! oh... I didn't checked..the button code is corrupted.. I'll fix it..thanks. Thanks Kranthi, Sorry to ask but could you make the logo and description larger as your original 'turn out mag' logo size...apologies for the extra work! Changed your button code and now looks and works fine, thanks again. One last question if I wanted to change the whole header as in the background to say a photo what should I do and look for in the code? can i use this with ( Stylish ) Template ? I am trying to update the old version as you advised. I made the first change. But I cannot find the html code in the second change. Is it possible my version does not have this at all? Help!!! thank u so much again for this very wonderful template! im looking for thumbnail of a website or blog for bloglist. I really must say again that this is a great template and your support is excellent, thank you. Just a quick follow up question...if I wanted to change the header, either the background colour or change to a photo what would I need to do and look for in the code? 1) The color of the text in the context area disappeared. and when I move my Mouse over it, it is start to come out ! How can I solve this? 2) When I post a message in Japanese, it showed almost the whole message, and it doesn't cut the message automatically. What should i do? 3) I changed the image title of the webpage, and when I move my Mouse over it, it seems like it is going to disappear. Check my web above for details. wow ur template is good, im download to make over my blog. 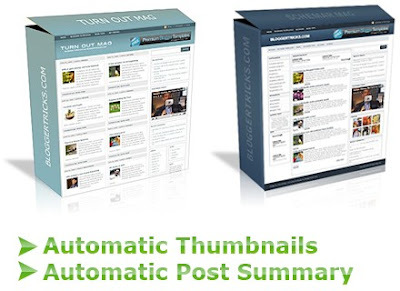 With new automatic thumbnails and summary are for me this new templates the best one ever made for blogger. Congratulations! Great templates and great support. You have made my day! One suggestion. It would be nice to see this templates in dark colors.. Anyway good job! BUT I HAVE A VERY BIG PROBLEM NOW ! This template displays only 20 posts per label which is the default blogger. But my labels have more than 20 posts which are not displayed in this template. Please advice me. Sorry for the anonymous post. I forgot to add my name. - Babaji M P.
Comment area needs some borders, icons etc. Post title is not "clickable"
There is no detailed descriptions on individual page such as "the date", "posted by","tags" etc. A subscription option in post footer would be nice. These are just suggestions dear. But what you did seems great. Something totaly new in the blogger's template world. It would be great if you worked a bit more on customizing these details. I've noticed the new SchemerMag template doesn't work with Internet Explorer. The text of each post doesn't appear on the main page. Is this just me or are others finding this? Sorry... but i don´t change the logo, be cause i can not find it. Could you help me? hi, can we add this feature to other blogger templates also ? I was wondering how to change the header background to make it more personalized? I also noticed the disappearing text on Internet Explorer. I have tried to change the code on my own but have been unable to find the correct setting to change. Help would be great. Hi! It's a great template. I'm using it now. Would like to know how I can make summaries appear in previous posts. Right now, only post titles appear when going to "older posts". i would like delete the "AUTOMATIC Post Summarize and Read More". How can i do it without affect the functions of the blog? But i am facing a strange problem. I just deleted one post which i did not even publish. It was just a draft and i deleted it. But it made a empty space for that post in my home page. Please see the blog once and let me know the fix. Hope you understood the problem. The second line first post is showing blank on homepage. I have another problem also. I put Google search on my blog and the submit button of Google search is not showing properly. Please help me to fix it. Hi, this template fits perfectly for what i'm looking for. However, I would like to change the ratio of the thumbnail. Can you help how to do it? thanks. The only issue I have not been able to figure out, is the Location tagger that is available in Blogger in Draft no longer shows. My readers really like this. Any suggestions on how to fix this problem. Thanks for the excellent layout! Very good job dude.. If you change the background to any other light colors..it would be perfect. Thanks! I did tweak the colors a little more and finally I think I'm finished. Any suggestions on how to get the Blogger in Draft Location feature to show on this template? i kranthi.. turn out mag.. a beautiful template indeed but only Main Page, the next page comes in the shape of links only, further it will look more adequate if it will have buttons like Previous and Next for page switching. hello kranty..firstly i want to said that your schemar mag template is beautifull and right now I'm using that template.for your info I got a problem, everytime I save the layout, blogger gave a error message but for me its ok..today i link back your website n found the updated one..acctually i dont like to change the old that im using now..but can u give me explanation how to fix that problem..
Hi, Kranthi! I really like how this template is easy to use and widget-friendly. I just have a very basic question, could you kindly teach me how to activate the email button on the upper righthand corner, please? Thanks so much! I used this template for my http://beautyinthebigapple.com site. For http://nyminutenow.com, I'm using the Nitelife. Thanks!